Among the top criteria influencing the shelf life of bread are the following: the bread ingredients used, the bread storage temperature and humidity levels, the type of storage container used, and the bread storage location. Breads prepared with only a few basic ingredients, such as flour, water, yeast, and salt, generally do not keep as long as yeast breads that have been enriched with eggs, butter, and milk. Breads prepared with a starter also keep longer than many of the basic flour and water breads. Quick breads are aptly named, because not only are they quick to prepare, but they are also quick to dry out; consequently, they are best when eaten on the day they are baked. 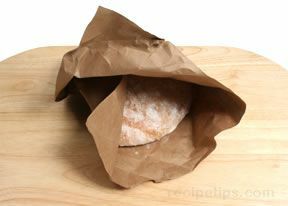 Many bakers recommend that a good loaf of freshly baked bread should not be stored in loose fitting plastic bags. 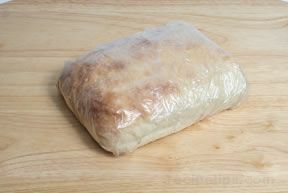 The plastic does not allow the bread to breathe, which can lead to moisture being trapped in the bag, resulting in bread that can be a bit soggy. If it is stored in the refrigerator, the loose fitting plastic bag can actually promote the growth of mold. Although it is true that most commercially prepared bread is sold in plastic bags, most of these breads are sliced and would dry out very quickly if not stored in plastic, and many of them also contain chemical preservatives to increase shelf life, so the issue of whether or not a plastic bag is good or bad is not a factor in this case. In many European homes, freshly baked bread is stored, cut side down, without any wrapping. Bread that has been prepared using a starter or with only a small quantity of yeast will keep for several days when stored in this fashion. Paper works well for bread storage because it allows some air to circulate around the bread. A cloth bag, used specifically for bread storage, is another good method that can be used. A large napkin or piece of cloth can also be used. 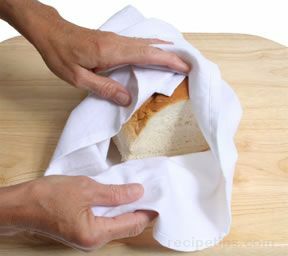 Cloth keeps the bread fresh, but also allows it to breathe. Note: Sliced loaves will dry out quickly when stored in paper or cloth. 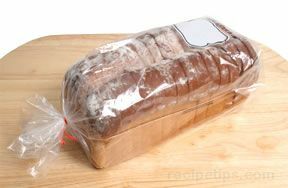 If you prefer to use plastic for storing freshly baked bread, make sure the bread is completely cooled and then wrap it tightly in plastic wrap rather than sliding the loaf into a loose fitting bag. The bread will keep for several days at room temperature and for up to three months in the freezer. Another method for freezer storage of freshly baked bread (which has been completely cooled) is to wrap the bread in heavy-duty aluminum foil and then slide it into a plastic freezer bag. Remove as much air from the freezer bag as possible before placing it in the freezer. Dough that has been kneaded, but has not risen can be placed into a freezer bag that has been lightly oiled on the inside. 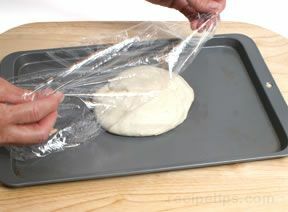 Some space must be left in the bag because the dough will rise slowly before it is fully frozen. When the dough is ready to use, it should be placed in the refrigerator to thaw overnight where it will rise slowly. 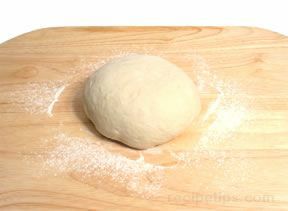 Remove the dough from the refrigerator, allow it to reach room temperature, and then shape and proof the dough. Dough that has risen and has been punched down and shaped can be frozen before the proofing stage. 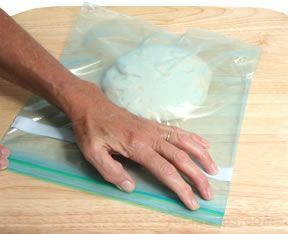 Simply cover the dough (on a baking sheet) with oiled plastic wrap and place it in the freezer until the dough becomes firm, but not fully frozen. 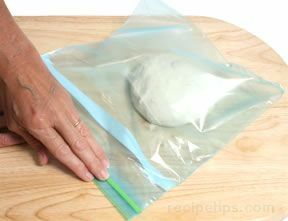 Transfer the dough to an oiled freezer bag, remove the air, and return to the freezer for long term storage. When it is ready to use, remove the dough from the bag, place the shaped dough on a baking sheet, cover it with oiled plastic wrap, and allow it to thaw in the refrigerator overnight where it will proof. Remove the dough from the refrigerator, allow it to reach room temperature, and then bake. It is best to defrost bread as slowly as possible. Six hours may be required at room temperature and twelve hours in the refrigerator. Make sure to leave the bread wrapped while defrosting. 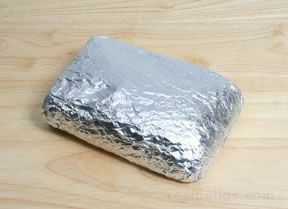 Bread wrapped in aluminum foil may also be defrosted in a 400ºF oven. 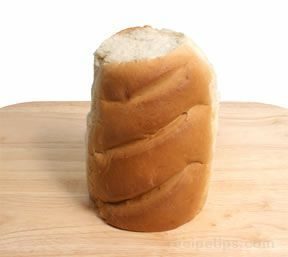 Avoid using the microwave for defrosting or heating bread because the microwave tends to dry out and toughen bread. "Please do not, NEVER, store bread in a refrigerator. It will stale in no time flat. Bread doesn't stale simply by drying out; it's a complex series of chemical/physical reactions known as "retrogradation". Essentially the starch, which was fairly crystalline (i.e. "graded") in the raw state becomes much more loose and wriggly when baked. If the resulting bread is kept in a refrigerator at 4°C (~40°F) the starch will go back (hence "retro") to this state - it will recrystallise. It will do this eventually anyway, but a sight faster at 4°C than at ANY other temperature. Good, home-made bread doesn't get the chance to go stale or mouldy anyway in the normal scheme of things! If you must keep bread, part-bake it (say 2/3 of the time), cool and freeze. When you're going to need it, defrost and then re-bake for 2/3 of the stated time. The re-baking "uncrystallises" the starch."